The Cisco Unified IP Conference Phone 8831 enhances people-centric communications, combining superior high?definition (HD) audio performance and 360-degree coverage for all sizes of conference rooms and executive offices. It provides an audiophile sound experience with a full-duplex two-way wideband (G.722) audio hands-free speaker. • The IP Conference Phone 8831 is a simple, scalable solution that meets the challenges of the most diverse rooms. It provides flexible deployment options and expansion by using extension microphones that can be wired or wireless (Digital Equipment Cordless Telephone [DECT]) with a daisy-chain configuration of two units. • The IP Conference Phone 8831 has an industrial design with enhanced ergonomics that puts the user first. It offers a detached control panel so that the display may be easily viewed without having to move the entire unit. It also provides easy view of device mute status from all sides. 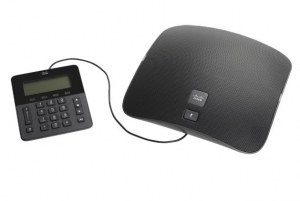 • Supported on Cisco Unified Communications Manager and Business Edition systems, the IP Conference Phone 8831 delivers a more productive, acoustically pleasing, and secure communications experience across sites and participants.